2015 September » Welcome to vSphere-land! Well that’s a wrap, another VMworld in the books, this is number 8 for me and how fast the event flies by never changes for me. It always seems like you wish you could of done and seen more there and that there was so much you missed out on but as there is so much going on it’s impossible to take in everything. For me I know there were some friends and acquaintances that I missed out on seeing which is always a priority for me as you usually only get to see them once a year. All in all though it was a good event for me but I will always regret not having been able to done more. Let’s start off with the event location, while San Francisco is a nice enough town to visit, it’s not an ideal conference destination. VMworld has gotten so big it’s spread out across several blocks and I frequently had to walk from Moscone North to South to West to the Marriott. All that walking wears you down and wastes time that you could of been doing more with. The crazy expensive hotel room gouging situation is ridiculous, paying double or triple for a room that is half as nice as a Venetian room. I paid about $550/night for a room at the Marriott that is now going for $279/night this week. Then there’s the whole street people thing that you have to constantly walk through that can wear on you as well. Well thankfully we get a change of venue as VMworld goes to Las Vegas in 2016 as the Moscone Center is under renovation next year. VMworld has been in San Fran in 2007, 2009-2010 and 2012-2015, it was in Vegas in 2005, 2008 and 2011 (2004 was San Diego and 2006 was Los Angeles). VMware was under contract to hold VMworld at Moscone until next year but now it looks like they are free to go anywhere and as a result you might see it in Vegas for a few years (heard that from someone at VMware). VMworld 2016 will be held at the Mandalay Bay resort from Aug. 28th-Sept 1st 2016, I’m guessing the Venetian where it usually was might have been unavailable that week. The pre-registration page is up already fro VMworld 2016 so you can be notified when it goes live. VMworld Europe 2016 is still being held in Barcelona, Spain. It might be a refreshing change to see VMworld somewhere else in the US other than Vegas or San Fran one of these years such as Chicago or Orlando. VMware claims record attendance of over 23,000 people this year which would top the previous high attendance of 22,500 in 2013. That was announced at the keynote, I haven’t seen VMware publish any attendance numbers anywhere. VMworld 2014 was “over 22,000” which probably puts it between 22,000-22,499. Since they didn’t say over 23,500 I’m guessing the attendance number for this year is under that. That’s good for VMware that the number is higher and I expect the number to stay right around there in coming years. Of that 23,000+ VMware doesn’t publish the mix of VMware employees, partners, sponsors and actual attendees. A week before the event the attendance report I saw had about 12,000 people in it so I’m curious as to what the mix is, I’m guessing that there are at least 5,000 VMware employee and sponsors in that number if not more. The announcements made at VMworld were few and not all that exciting as the event did not align with a major new release of vSphere. VMware slapped a new name on EVO:Rack which was announced last VMworld and is now calling it EVO SDDC which is a bundle of compute (ESXi), storage (VSAN), networking (NSX) and management (vRealize Ops) at rack scale. But it still isn’t a shipping product and won’t be a for a while (1st half 2016). The new release of VSAN was announced, it’s an incremental update to VSAN 6.1 and will be available later this month, you can read all about what’s new in VSAN 6.1 here. VMware hasn’t announced a new vSphere version to support VSAN 6.1 but as it’s built into the hypervisor I’m betting you will see vSphere 6.1 released later this month. VMware also made announcements around hybrid cloud with new vCloud Air Disaster Recovery Services which is basically just SRM running in a public cloud (of course they called it SRM Air). They also announced new vCloud Air Object Storage and vCloud Air SQL. It’s no secret that VMware has a big focus on containers and they announced as a technology preview both vSphere Integrated Containers and the Photon Platform. You’ve probably heard about Photon already but vSphere Integrated Containers is a new announcement that brings together several cloud-native technologies including Project Bonneville (container security and isolation), Project Photon OS (formerly Project Photon), and VMware’s Instant Clone technology (a feature of VMware vSphere 6) that will bring together the best of VMware vSphere with containers. Finally on the EUC side they announced some new stuff for universal application delivery and device management which is based on their new tech preview called Project A2 that integrates application delivery into Windows 10 through AirWatch and App Volumes. Read all about it here. I didn’t attend many as there are so many other things to see and do at VMworld and the sessions are all recorded anyway to watch later. I went to one on VAIO but the VMware speaker was obviously reading from a script which kind of killed the session for me so I left. The other was the Graybeard’s on Storage panel but it turned into a VVol bashing session so I didn’t stay long. I was a speaker at 4 sessions, 2 of them were our HP sponsor sessions, 1 was VMware’s VVol technical panel and the last was my Top 10 Things You MUST Know Before Implementing VVols session. The technical panel went pretty well, it was narrated by Ken Werneberg from VMware, we had about 175 people in the room. My VVols session was on Thursday morning, I had to extend my stay a day but it was worth it. I had 560 people registered for it and 279 people in the room. If you didn’t make VMworld you can still view some of the sessions that VMware recorded and released to the general public. Also check out these other resources as well. I’m 100% confident that number is going to VMworld for the food, the lunches that are served throughout the conference continue to be bland and terrible. They improved the packaging of the box lunches this year which is like putting a fancy wrapper on a turd. I decided to be brave and try one as I was in a hurry and took a bite or two and tossed it as it just wasn’t tasty. Let’s face it the Moscone Center isn’t a hotel or a restaurant and the food they serve is no comparison to other VMworld’s that were at Vegas hotels that are equipped for cooking good food. What about the Solutions Exchange? The Solutions Exchange is were many attendees spend a lot of time taking in the entire VMware partner ecosystem which continues to grow and grow. It seemed more dense this year as if there were more vendors in there and felt a bit more crowded. A lot of small vendors were going big there in an attempt to get the attention of attendees and I’d say at least a third of the partners were storage related. I spent a good amount of time there and there seemed to be good and steady traffic through the floor which is good for the partners that put a big investment into the event. There were probably a dozen vendors there that had special gifts for those that are chosen as vExperts. It’s good to see these vendors recognize the value of the vExpert community and do something special to reward those who give back and evangelize about VMware and virtualization. As the vExpert population has grown quite large these days (1,200) I’m sure it’s more of a financial and logistic burden to do this so I wish to thank those vendors that did it which includes Cohesity, Coho Data, Simplivity, Datrium, Catalogic Software, SolidFire, Tegile and DataGravity. After VMworld is over each day there are no shortage of parties to attend so you can relax and chat with other attendees after a busy day. I went to the VMunderground party on Sunday which was really good, they had a big venue at the Metreon again and you didn’t have to deal with tickets this year to get in, thank you to all the vendors that sponsor it. The always epic Veeam party was also at the Metreon this year and was a lot of fun as they had a band playing and people got very creative and playful with the glow rings that they were passing out which reminded me of the VMworld 2008 party at the Vegas Speedway. I also attended the vExpert party which was in a fancy historic ballroom, they tried to do something different by assaulting us with PowerPoint for the first hour which wasn’t all that well received as much of it was around marketing strategies. 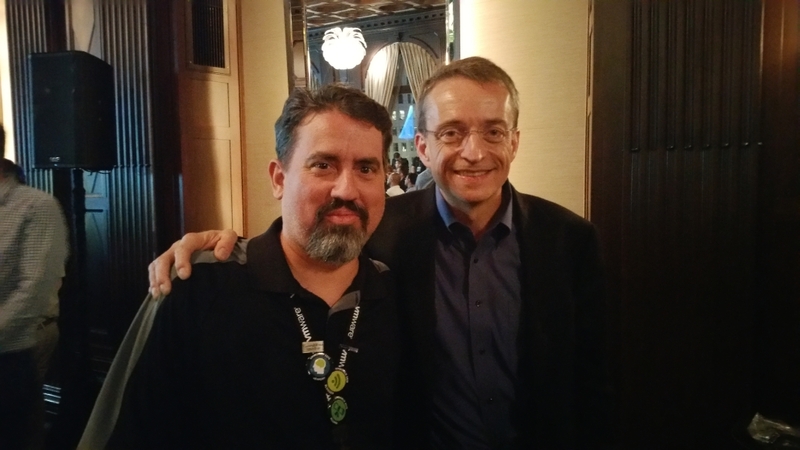 I actually prefer the more informal gatherings that allowed you to socialize more with vExperts and special guests like Pat Gelsinger. I do appreciate the efforts that they put into having an event for vExperts at VMworld and hope they continue that tradition. Speaking of Pat, I did get my 3rd annual picture with him and he told a neat story about his days at Intel when he ran into Mendel at a conference the day they figured out how to get vMotion to work. The official VMworld party I passed on as it was at AT&T Park and I didn’t want to go that far away and the bands were mediocre again this year. I still hold out hope that VMware will get a decent big name band to play at VMworld in the coming years. 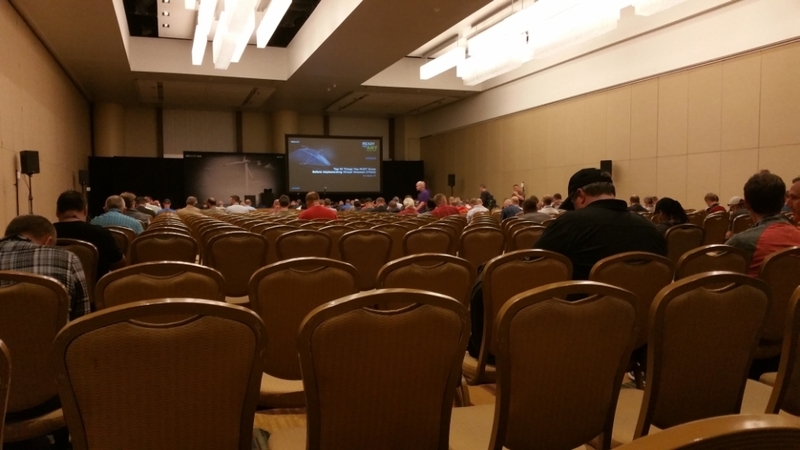 Last week I wrote about how you could get value out of VMworld even if you did not attend it. One of the things I mentioned is that VMware typically releases some of the most popular sessions (as well other sessions that they want to promote) to the general public shortly after VMworld. Well VMware has done just that and released the sessions below onto YouTube. VMware usually releases these in batches so keep checking back as they may publish more of them later on which I will add to this page. For the rest of them that they don’t post you’ll have to get a VMUG Advantage membership or a VMworld session subscription to view them. CNA5860 – Containers without Compromise – Persistent Storage for Docker Containers with VMware (Vivek Saraswat, VMware) New! CTO6453 – The Future of Software Defined Storage – What Does It Look Like in 3 Years Time (Richard McDougall, VMware) New! EUC4827 – VDI Sizing Deep Dive – The Horizon Sizing Tool (Ray Heffer, VMware – Shengbo Teng, VMware) New! EUC4879 – Horizon View Storage – Let’s Dive Deep! 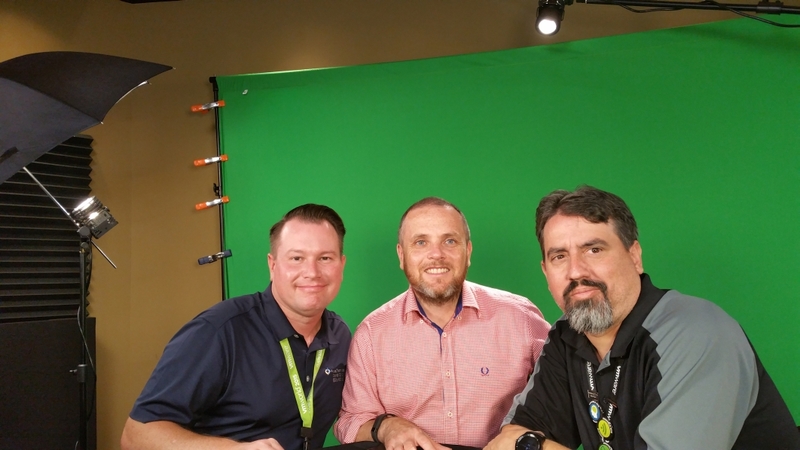 (Tristan Todd, VMware – Michael Cooney, EMC – Jim Yanik, VMware) New! EUC5052 – Beyond the Marketing – Horizon 6 Technical Deep Dive (Ray Heffer, VMware – Jim Yanik, VMware) New! EUC4437 – Horizon View Troubleshooting – Looking Under the Hood (Jack McMichael, VMware – Matt Coppinger, VMware) New! INF4764 – Extreme Performance Series – vCenter Performance Best Practices (Ravi Soundararajan, VMware) New! INF4793 – Day-to-Day Automation of VMware Products to Increase Productivity and Efficiency (Brian Graf, VMware) New! INF5093 – vSphere Web Client – Yesterday, Today and Tomorrow (Yavor Boychev, VMware – Dennis Lu, VMware) New! INF5060 – What’s New in vSphere (Michael Adams, VMware) New! INF4944 – Managing vSphere 6 Deployments and Upgrades, Part 1 (Dilpreet Bindra, VMware – Mohan Potheri, VMware) New! INF5123 – Managing vSphere 6 Deployments and Upgrades, Part 2 (Brian Graf, VMware – Salil Suri, VMware) New! INF4529 – VMware Certificate Management for Mere Mortals (Ryan Johnson, VMware – Adam Eckerle, VMware) New! INF4712 – Just Because You COULD, Doesn’t Mean You SHOULD – vSphere 6 Architecture Considerations from Real World Experiences (Jonathan McDonald, VMware) New! INF4945 – vCenter Server 6 High Availability (Madhup Gulati, VMware – Mohan Potheri, VMware) New! INF5701 – Extreme Performance Series – vSphere Compute & Memory (Fei Guo, VMware – Seong Beom Kim, VMware) New! NET4976 – vSphere Distributed Switch 6 –Technical Deep Dive (Chris Wahl, Rubrik – Jason Nash, Sirius) New! NET4989 – The Future of Network Virtualization with VMware NSX (Bruce Davie, VMware) New! STO4649 – Virtual Volumes Technical Deep Dive (Ken Werneburg, VMware – Patrick Dirks, VMware) New! STO4474 – Networking Virtual SAN’s Backbone (Bhumik Patel, VMware – John Kennedy, Cisco) New! STO5888 – Top 10 Thing You MUST Know Before Implementing Virtual Volumes (Eric Siebert, HP) New! STO5074 – Explaining Advanced Virtual Volumes Configurations (Ken Werneburg, VMware – Andy Banta, SolidFire) New! STO6137 – Site Recovery Manager and Policy Based DR Deep Dive with Engineering (GS Khalsa, VMware – Aleksey Pershin, VMware) New! VAPP6257 – Troubleshooting for vSphere 6 (Jamie Rawson, VMware) New! VAPP5598 – Advanced SQL Server on vSphere (Scott Salyer, VMware – Wanda He, EMC) New! VAPP5483 – Virtualize Active Directory, the Right Way! (Deji Akomolafe, VMware – Matt Liebowitz, EMC) New! VAPP5719 – Monitoring and Managing Applications with vRealize Operations 6.1 and vSphere 6 (Jeff Godfrey, VMware – Ben Todd, VMware) New!